The world faces major challenges that scientists and researchers alike have to help solve every day. We asresearchers are interested in illustrating these challenges in a fun and approachable way to students. With the help ofprograms such as WIPREM, Nanodays and Science onWheels, our research group is able to create/translate educational concepts related to our field that will help captivate and excite students into fundamental science and engineering. Thesethree organizations joined forces on Friday, April 29th, 2011 by creating a major educational activity for students from elementary to high school. The event conglomerated around 2,000 students in the Rafael Mangual Coliseum at the University of Puerto Rico, Mayagüez Campus. Our research group was interested in explaining Brownian motion in a very illustrative manner to the students participating in this event. To get along with themessage, we showed a micro-sized particle dispersion in water using an optical microscope. A macro-scaled model was also constructed to easily visualize molecule collisions with a colloidal particle and its role in inducing diffusive motion. Finally, particle tracking techniques were explained in context with the work with do in our research group. 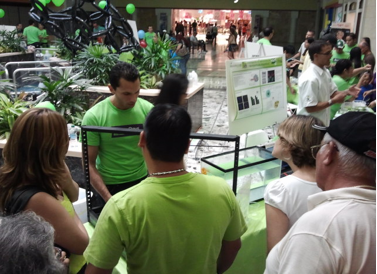 NSF-sponsored outreach activity “Nanodays” was carried out on April 14th, 2012 in Mayagüez Mall at Mayagüez, Puerto Rico. The main objective of this event was to show to the local community, especially K-12 students, some important features of nanotechnology. 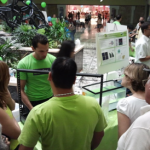 Several research groups from the University of Puerto Rico at Mayagüez of different backgrounds presented simple and interesting experiments/demonstrations about the relevance of nanotechnology and how it affects our world. Related concepts were organized in stations. Our research group was present with a few hands-on experiences to explain two key physical phenomena observed at nanoscales: Brownian motion and inertialess particle dynamics. 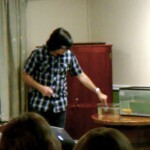 The “Brownian motion” demonstration consisted of a small box with marbles representing fluid molecules around a disk or the colloidal particle. Visitors had the opportunity to interact with this experiment by pushing the “molecules” into the “colloid” and causing random displacement. Also, they had the opportunity to see how the “colloid” was tracked in 2D space using a camera and computer software. Before explaining the concept of inertialess particle dynamics to the visiting public we first explained several basic concepts, such as viscosity, forces and energy. We conducted an experiment consisting of two “swimming” toys (submarines), one submerged in water and another in corn starch. The visitors were able to see the toys swimming in each fluid and see clearly how viscous fluids causes higher friction in the motion of a propelled object. In corn starch, the toy displacement was negligible. All the energy created by the toy was absorb by the viscous fluid but it was disseminated very slowly in comparison to water. This experiment was motivated by classic educational videos from G.I. Taylor in Low Reynolds Number Flows (see part 1 and part 2). “Nanodays” was offered by 37 graduate students, 54 undergraduates, 2 high school teachers and 8 professors with over 2,000 visitors to the stations. A poll carried out to 500 participants gave us important data for improving our demonstrations for future ocassions. In summary, 30% of our visitors were high school students and 40% ranged from 35 to 60 years old, where the 99% of visitors stated that they understood all nanotechnology concepts presented on the stations. These statistics justify that our group did an excellent job in presenting these concepts. 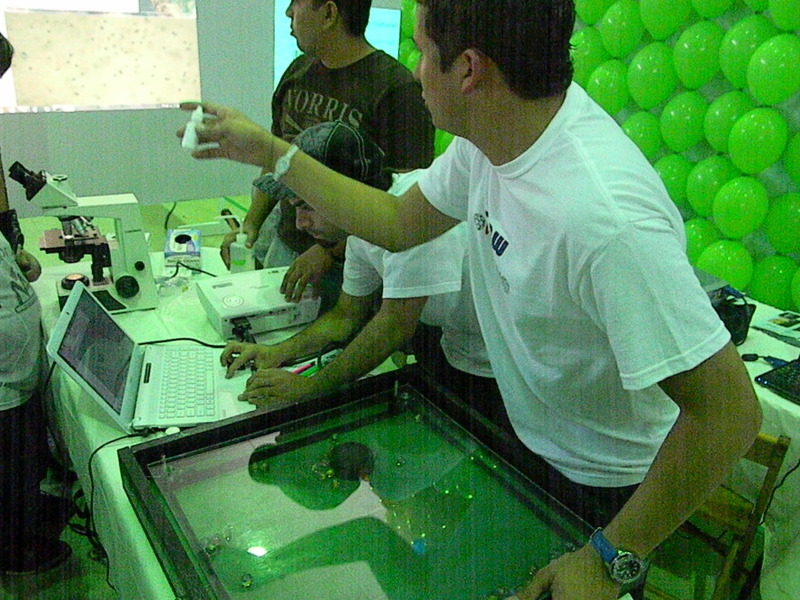 An interest not only in nanotechnology but in STEM fields in general was created among all visitors. This is encouraging because it motivate us to continue supporting and believing in this initiative and work harder for future activities. Our group recognizes that delivering abstract concepts encountered in our daily work is crucial for the improvement of education in STEM fields. On May 26th, 2012, the PI and his research group participated in a workshop for local math and science teachers also coordinated in collaboration with SONW and NSF Wisconsin-Puerto Rico PREM. The event took place in Hotel Villa Antonio, Rincón, PR and it was the third time offered in the last few years. Its main focus was on providing ideas, simple demonstrations and accessible documentation so that teachers can introduce fundamental problems and activities in fluid mechanics and colloidal sciences to their respective classrooms. Teachers received drafts of educational modules prepared by the PI and two graduate students as guiding material for their classes. Other researchers from UPRM also gave presentations on other topics of materials science, particularly on the subject of nanotechnology. As in NanoDays, the group mainly discussed viscous forces and Brownian motion in connection to self-propulsion of objects at small Reynolds number. A combination of hands-on experiences and a formal presentation were provided. This was a great opportunity to introduce to teachers basic concepts in physics and guide them to understand other advanced topics that the PI is currently working on. For example, the physical meaning of viscosity was easily communicated using visual examples of every-day fluids, such as ketchup, water, and paste, among others. This introduction was also guided by repeating the experiments of G.I. Taylor with two toy submarines in two fluids with very different viscosities. Teachers also learned the difference between Newtonian and non-Newtonian fluids based on their response when a force (or shear motion) is applied. Finally, participating teachers also learned the origin and importance of Brownian motion. A box with marbles and a disk were used to explain its origin, as similarly done in NanoDays. At the end of this experience, the PI dedicated a considerable amount of time discussing Janus and catalytically-driven colloidal particles. This section was very exciting and teachers asked many questions of the potential of these particles for nano-medical applications. In conclusion, the activity in general was a complete success and teachers were excited to implement all these topics to their respective classrooms. At the end of the workshop, an evaluation form was passed to teachers and rated the event with a score of 4.8/5. A copy of the presentation was uploaded to YouTube and can be accessed by anyone at the PI’s website or upon request. Follow up events are being coordinated with SONW. This is relevant to measure true long-term impact of these workshops and to formulate other outreach activities.